The "doom and gloom" predictions of many respected economic analysts caused a surge in demand for bullion coins. Even though the precious metal futures show that the figure is fluctuating. 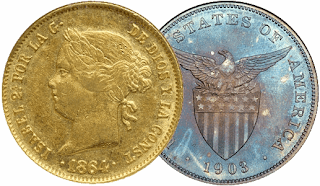 Some mints have already suspended selling their inventories, including the bullion coins from the United States. Basically, bullion coins have been proven effective as a street smart safe haven investment against inflation. The collapse of some of the bright economies around the globe triggered a panic buying that some people have already diverted their cash to solid investments such as bullion coins. Meanwhile in Europe, retirees instead of waiting for their 401K to vanish into thin air due to massive institutional bankruptcies have decided to pull away their savings from the bank and bought themselves either gold or silver bullion. Local dealers have reported the sudden jump of coin buyers particularly, people who are first time buyers of coins. Old United States-Philippine or USPI coins, pre-1944 coins and commemorative bullion coins are the best sellers of the month. In the United States, stories of the coming economic collapse and the new currency called the Amero have flooded the internet. Amero is the new currency secretly setup to replace the American dollar, according to some conspiracy theorist. Here is one spoof, narrating the changes taking place in the United States Financial system.